Heat the oven to 350 degrees F. Grease the bottom and sides of an 8 x 2-1/2-inch or higher springform pan. Bake the cheesecake: Pour the batter into the prepared springform pan. Set the pan in a larger pan (a 12 x 2-inch cake pan or a roasting pan) and surround it with 1 inch of very hot water. Check that the oven is at 350 degrees F and bake the cake for 45 minutes. Turn off the oven without opening the door and let the cake cool for 1 hour. Transfer the cheesecake to a rack (the center will still be jiggly) and cool to room temperature, about 1 hour. Cover the pan with plastic wrap and refrigerate for at least 6 hours or overnight. 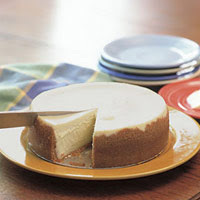 Unmold and slice the cheesecake: Be sure the cheesecake is thoroughly chilled. Have ready a serving plate and another flat plate that's at least as wide as the springform and covered in plastic wrap. Wipe a hot, damp cloth around the outside of the ring (or use a hair dryer). Run a metal spatula or a thin knife inside the ring. Release and gently loosen the ring and then lift it off. Set the plate with the plastic wrap on top of the cheesecake and carefully invert the pan. Heat the base of the springform with a hot, damp cloth or hair dryer and lift it off. Set the serving plate lightly on the bottom of the cheesecake (which is now facing up) and reinvert the cake. Lift off the plastic-wrapped plate. This entry was posted on 2:10 AM and is filed under Desserts . You can follow any responses to this entry through the RSS 2.0 feed. You can leave a response, or trackback from your own site.